You have users on different domains in your business. For example, Rob@ContosoEast.com and Ann@ContosoWest.com. You want the people in your organization to use Skype for Business to contact people in specific businesses outside of your organization. OR, you want everyone else in the world who uses Skype for Business to be able to find and contact you, using your email address. If you and they use the default Skype for Business settings, this will work automatically. If they don’t, then they need to make sure their configuration isn’t blocking your domain. Sign in with your Office 365 admin account at https://portal.office.com/adminportal/home. 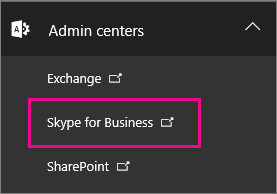 In the Office 365 admin center, go to Admin Centers > Skype for Business. In the Skype for Business admin center, choose organization > external communications. To set up communication with a specific business or with users in another domain, in the drop down box, choose On only for allowed domains. OR, if you want to enable communication with everyone else in the world who has open Skype for Business policies, choose On except for blocked domains. This is the default setting. Under blocked or allowed domains, choose + and add the name of the domain you want to allow. Now make sure the admin in the other organization does these same steps in their Skype for Business admin center. For example, in their allowed domains list, their admin needs to enter the domain for your business. If you’re using Windows Firewall, Skype for Business opens the required ports automatically. If your organization is using a different firewall solution to restrict computers on your network from connecting to the Internet, ensure your client computers are able to access the following FQDNs. This may require adding the FQDNs to the outbound allow list in your firewall or proxy infrastructure configuration: *.api.skype.com, *.users.storage.live.com, and graph.skype.com. WAIT UP TO 24 HOURS TO TEST. Any time you change the external communications settings, it can take up to 24 hours for the changes to populate across all the data centers. You can allow your users to search for and IM with everyone who uses Skype, the free consumer app! To learn more, see Let Skype for Business users add Skype contacts. The most common issue people encounter when setting up business-to-business communication is getting their firewall settings right. To test your setup, you need a contact on Skype for Business who’s not behind your company firewall. After you change your external communications settings, WAIT UP TO 24 HOURS TO TEST. In Skype for Business, search for your contact in Skype for Business, and send a request to chat. If you get the message it couldn’t be sent due to company policy, you need to doublecheck your firewall settings. Ask your Skype for Business contact to send you a request to chat. If you don’t receive their request, the problem is your firewall settings (assuming they’ve already confirmed their firewall settings are correct). Another way to test whether the problem is your firewall is to go to a wifi location not behind your firewall such as a coffee shop, and use Skype for Business to send a request to your contact to chat. If the message goes through there, but not when you’re at work, then you know the problem is your firewall. 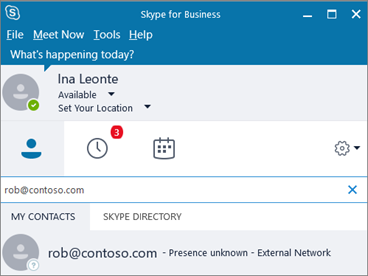 After you enable external communication with other Skype for Business users, your users can find federated Skype for Business users by searching for their sign in name, for example, Rob@contoso.com. Then they will need to add the person to their list of contacts. To configure federation between Skype for Business 2015 and Skype for Business Online, see this TechNet article: Configure federation with Skype for Business Online. To configure federation between Lync and Skype for Business Online, see this TechNet article: Configuring Federation Support for a Lync Online Customer. When two Skype for Business users in Office 365 are communicating with each other on separate domains, they can only use Skype for Business features (for example, video conversations or desktop sharing) that are turned on in both organizations. If a Skype for Business user in your organization is put on an In-place or Litigation Hold, any IM conversations between that user and other Skype for Business or Skype users will be saved in Recoverable Items in their mailbox. These conversations aren’t saved in the Conversations History folder in their mailbox.